I was swatching for the Zipper Cowl from Interweave Knits Fall 2014 (shown below) in the cozy window seat at my LYS, JP Knit & Stitch, when one of the staff girls peeked over my shoulder— “Ooh, I love brioche!” “Actually,” I explained, “this is fisherman’s rib. It looks like a brioche stitch, but is worked differently.” She seemed dubious. And to tell the truth, I was bluffing—I wasn’t exactly sure what the difference was between brioche and fisherman’s rib. But I was determined to find out. As I consulted stitch dictionaries and made swatches, it became clear that, whatever you called it, fisherman’s rib and brioche made a really similar fabric. But the underlying similarities were utterly confounded by a bewildering maze of terminology. It seemed that the fisherman’s rib and brioche methods had entered into the American knitting scene at various times under different names. A century later, Mary Thomas’s Book of Knitting Patterns gave instructions for “Brioche Stitch or English Brioche” as well as “Turkish Brioche,” but noted that the stitch was also known as shawl stitch, reverse lace stitch, oriental rib stitch, and point d’angleterre (English stitch). Another common designation, “Shaker stitch,” describes a half-brioche/fisherman’s rib fabric (where the doubled stitches are worked every other row, instead of every row). In contrast to this confusing riot of terminology, Nancy Marchant (Knitting Brioche, 2009) notes that Dutch knitters use a single name—patentsteek— to refer to both fisherman’s rib and brioche techniques. The distinction between fisherman’s rib (shown in our header image in the Opulent Cowl) and brioche can be best understood by examining swatches of the fabric with live stitches still on the needles. Swatch 1 illustrates the brioche method popularized by Nancy Marchant, based on a yarnover, slipped stitch, and k2tog. Swatches 2 and 3 demonstrate an alternate method using k1-below or p1-below (working into the first row of stitches below the live stitches on the needle) to create the same stitch structure. This method is commonly referred to as fisherman’s rib. By working into the stitch below the one on the needle, the stitch from the row below is converted into a slipped stitch, and the stitch on the needle into a yarnover. Both the brioche and the fisherman’s rib methods create a doubled stitch, with both a stitch and a hidden float captured by each new stitch. The brioche method achieves this doubling horizontally, making a yarnover and then working it together with a slipped stitch in the subsequent row. Fisherman’s rib creates the doubling vertically, compressing a column of two stitches into one. Although the resulting fabrics are almost indistinguishable, the two methods look very different on the needles. The brioche method creates an unusual set of stitches, with a yarnover lying on top of the slipped stitch. 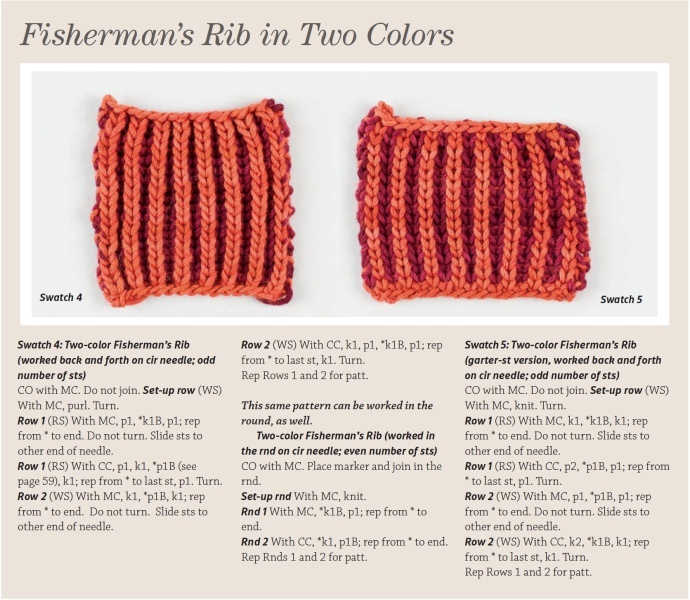 The fisherman’s-rib method is more straightforward, with recognizable knit and purl stitches. A variation on this method (Swatch 3) alternates k1-below and knit stitches. The underlying garter-stitch base is visible in the row just below the needles. The fabrics have subtle differences. The different ways of working the stitch change the relative position of the hidden float, impacting the overall tension within the fabric. In the brioche method, the float is truly hidden, tucked exactly beside the slipped (visible) stitch. In the rib-based fisherman’s rib, the float is slightly twisted underneath the slipped stitch, creating a higher tension fabric. The garter-stitch version of fisherman’s rib has the widest, flattest fabric, with the float riding slightly above the worked stitch. The floating yarnover must be held in place by the stitches at either side in order to maintain the fabric structure, so the k1-below/p1-below technique can only be used every other stitch. 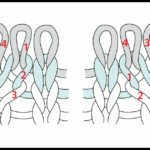 This stitch structure must be maintained when shaping the fabric through increase or decreases. Unless the shaping takes place at the edge of the fabric, all increases or decreases must be double— adding or removing a set of two stitches, both the projecting k1-below stitch and the recessed p1 stitch. Working into a stitch that has already been doubled releases the floating yarnover, so stitches may only be doubled once. Needles: When working fisherman’s rib or brioche, use a needle two to four sizes smaller than you would for stockinette stitch. The extreme depth and three-dimensionality of the stitch requires much higher tension in the yarn than a comparable flat fabric. Yarn: Round, sturdy yarns that resist flattening or compression will create the best stitch definition. Because the fabric has such deep texture, projects worked in fisherman’s rib may require up to 35 percent more yarn than a comparable stockinette stitch project. Gauge: Fisherman’s rib/brioche fabrics are compressed vertically and spread laterally. When measuring gauge, it’s important to remember that each visible stitch “V” is the product of two rows. The various methods of creating brioche or fisherman’s rib fabric have slightly different gauges, so remember to check your gauge carefully if you’re substituting an alternate method. Adding a second color creates an intriguing and beautiful fabric variation, with alternating vertical columns of color on both sides of the reversible fabric. This “colorwork” has the added bonus of using only a single yarn in each row, with no second color to carry and manage. The two colors should be switched after each row, which is easy to do when working in the round. When working a flat fabric, each row is worked twice (first in the MC, then in CC) before the work is turned, to maintain the position of the working yarn at the beginning of each row. Use double-pointed needles or a circular needle so you can work each side twice before turning. As noted earlier, increases and decreases have to be handled in pairs of stitches when working in fisherman’s rib, but you have the option of working increases and decreases in knit, purl, and either right, or left slanting. 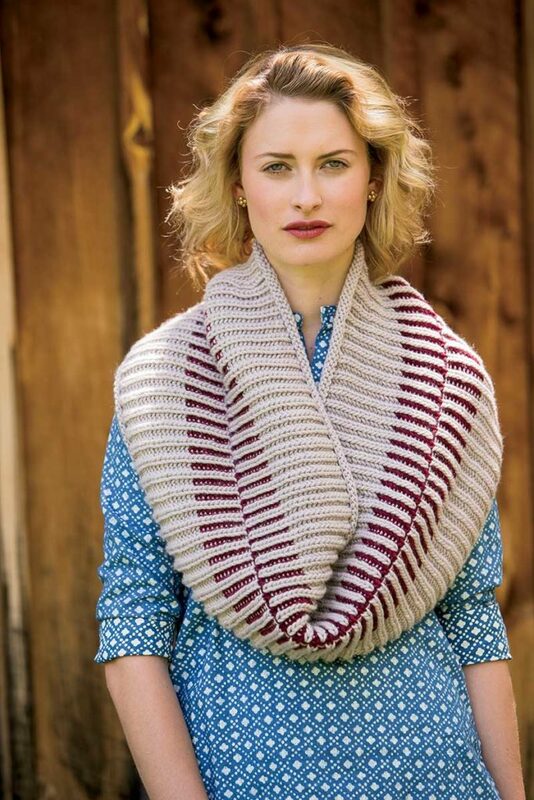 You can also work cables in fisherman’s rib—and they’re reversible! Cables and color can be combined to magnificent effect as well. 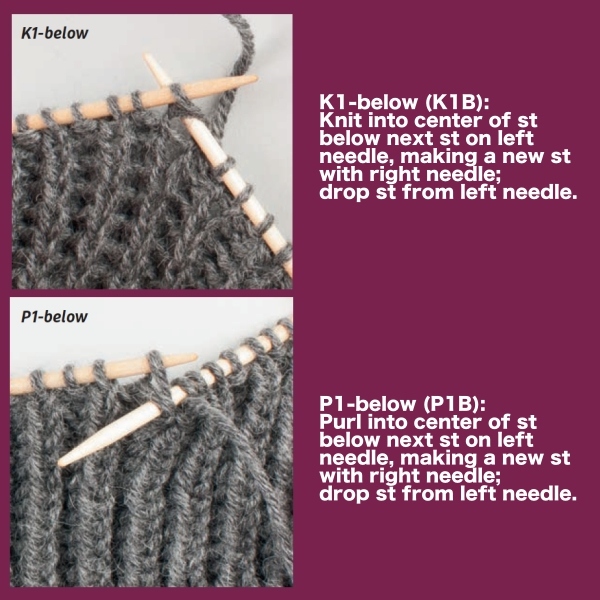 The k1-below/p1-below technique yields some surprising outcomes when applied to familiar knit-purl combinations, such as staggered or broken-rib patterns. Fisherman’s Rib is so versatile—it can even be used in warm-weather wear, such as the Time-Out Tank. Intrigued by the possibilities? 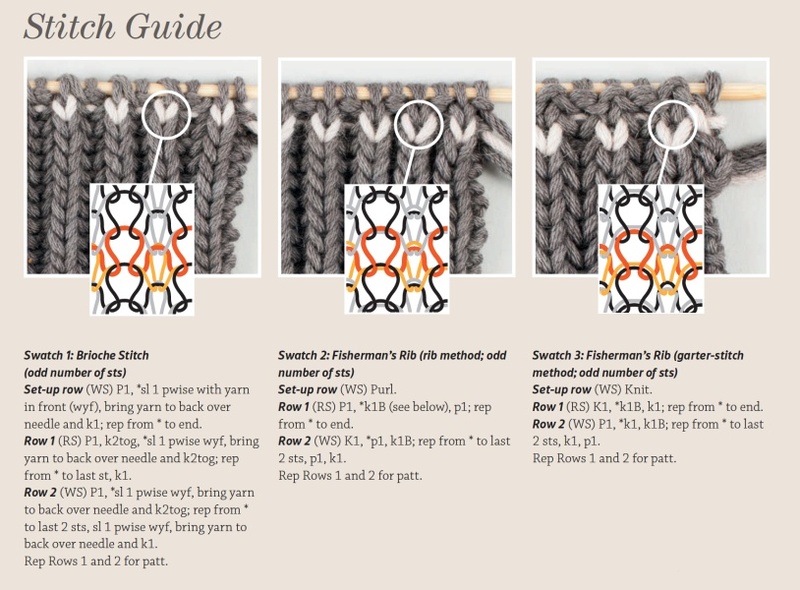 Pick up some needles and yarn and test the basics covered here, then tackle some of the more advanced variations. And check out the resources below for additional information. What a helpful overview & explanation – thanks! I am glad to better understand how two such different techniques result in such similar fabric. Having done both now, I must say I prefer Brioche. Fisherman’s Rib requires more attention, at least for me, as I have to be looking every time I knit into the stitch below to make sure I hit it right. With brioche I get into the rhythm with less effort, plus I find it easier to read my work. Thanks again for such an informative article! Thanks for this! Which has the most “pull”/elasticity similar to a regular k1p1 rib? I’d like to make a two-color cowl/shrug that needs to have stretch to stay on the shoulders without falling down. The original pattern is just written in k1p1 rib but I’m wondering if there’s a two-color version that would have similar properties. Thanks!